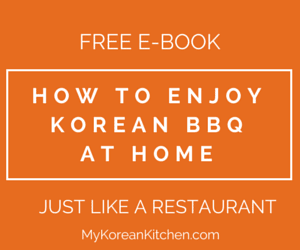 Korean anchovy side dish recipe – Myulchi bokkeum (멸치볶음)! 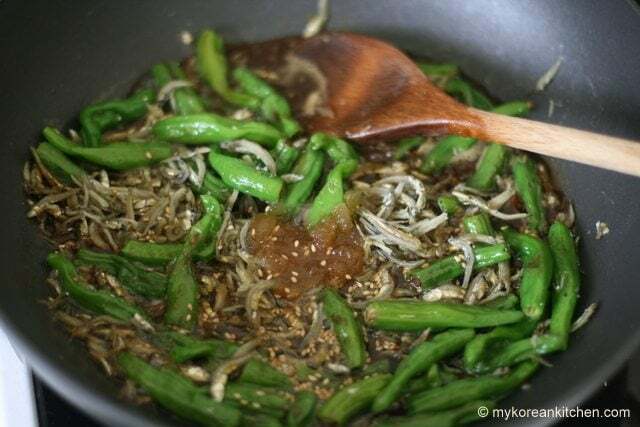 Pan fried Korean anchovies are salty, sweet and delicious. For an extra texture and flavor, it’s paired with shishito peppers! 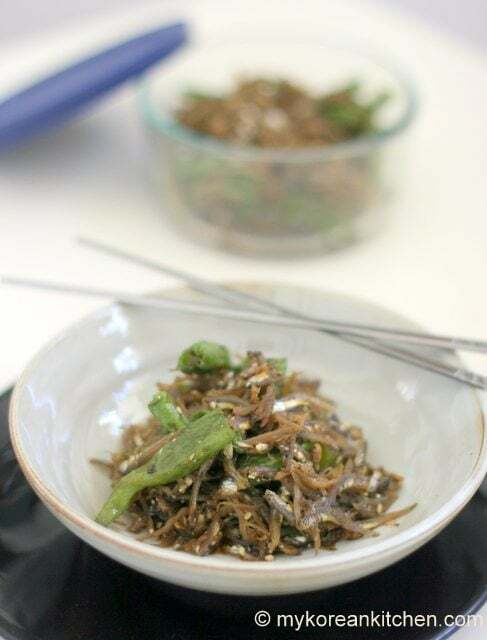 I just made this delicious Korean anchovy side dish with shishito peppers (Kkwarigochu / 꽈리고추) and dried anchovies (Myulchi / 멸치). 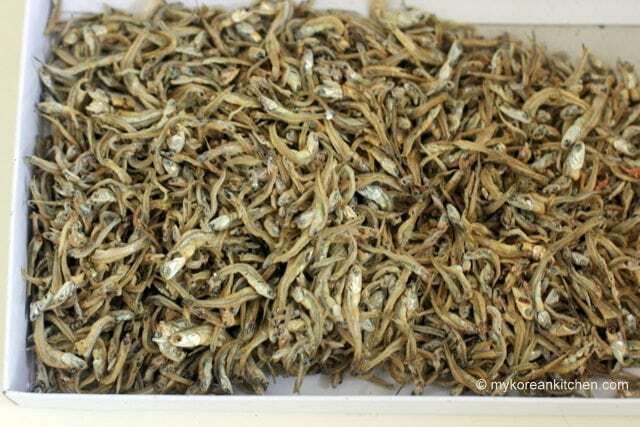 Essentially, dried anchovies are coated in salty, nutty and sweet sauce and they are pan fried. 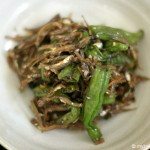 There are a few different ways to make Korean anchovy side dish, and this version includes shishito peppers. 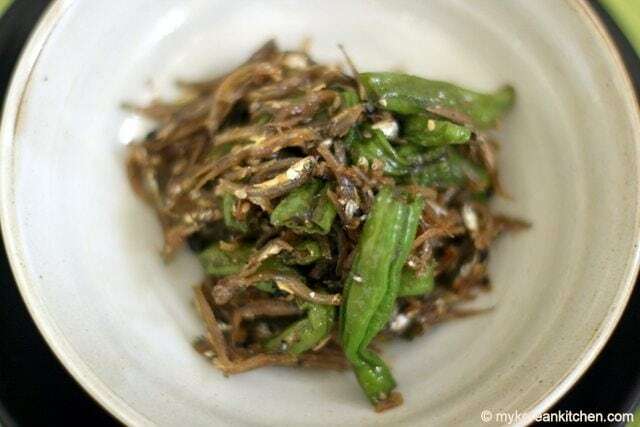 Apparently, anchovy is rich in calcium but it lacks vitamin C. So accompanying it with shishito pepper, which is rich in vitamin C is a good way to make dried anchovy dish! Often shishito peppers are not hot and it’s rather (peppery) sweet. However, you can ended up with some random hot shishito peppers too! So, watch out for that. Shishito peppers really gives nice crunch texture and I think they are a perfect companion to dried anchovies. This anochovy side dish is quite addictive. 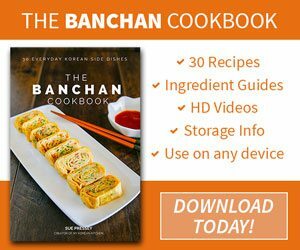 I can finish my bowl of rice without anything else! I hope you give this a try soon! 1. Put the shishito peppers in a strainer and wash them in running water. Drain and trim off the stems. 2. Put the dried anchovies in a strainer and shake them lightly to remove any debris / dusts. 4. 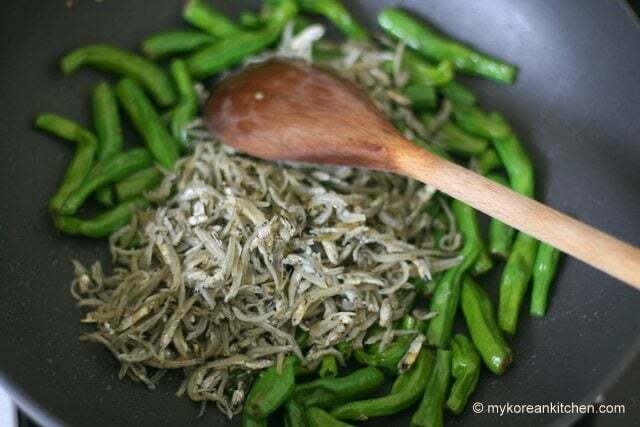 Take anchovies out and quickly rinse the wok. (This step is only necessary if you are using only one wok). 5. 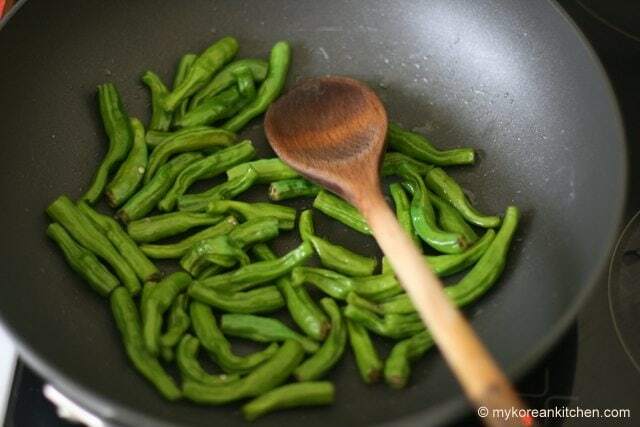 Put a dash of rice bran oil in the clean wok and once heated add the shishito pepper. 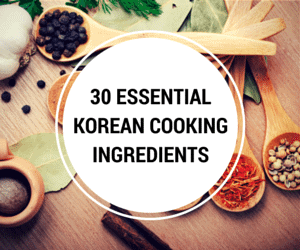 Lightly fry it for about 2 to 3 mins. 6. Add the anchovies into the wok and stir for about 1-2 mins. 7. Add the prepared sauce and simmer it for about 3-4 mins. 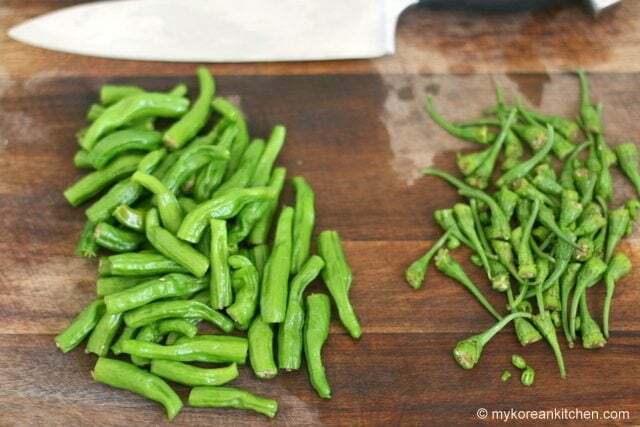 Put the shishito peppers in a strainer and wash them in running water. Drain and trim off the stems. Put the dried anchovies in a strainer and shake them lightly to remove any debris / dusts. Take anchovies out and quickly rinse the wok. (This step is only necessary if you are using only one wok). 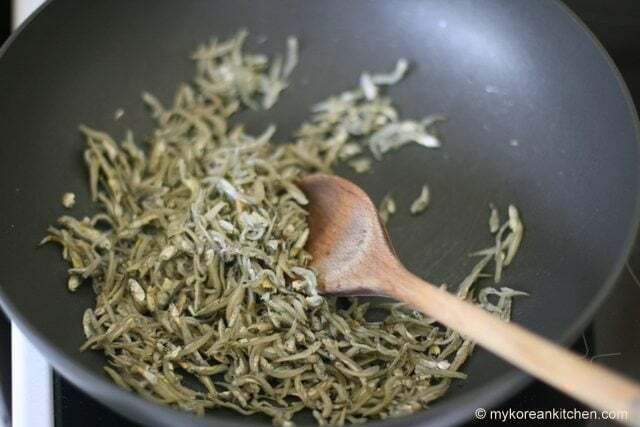 Put a dash of rice bran oil in the clean wok and once heated add the shishito pepper. Lightly fry it for about 2 to 3 mins. Add the anchovies into the wok and stir for about 1-2 mins. Add the prepared sauce and simmer it for about 3-4 mins. very tasty! i just bought korean twist peppers at the local market and had anchovies on hand. This looks yummy. Shishitos are not in season in the northern hemisphere and rarely seen in stores. Can I substitute another type of pepper? I just googled the substitues for Shishito peppers and Padron peppers were recommended. Apparently it has a similar taste but it might be a bit more spicier? I hope this substitute turns out well and let me know how you go. Please refer the below links for more information.